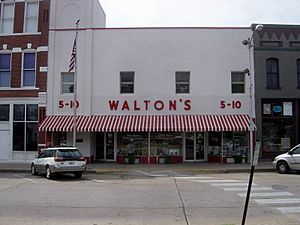 The Walmart Visitor Center is located on the Bentonville town square in Sam Walton's original Walton's Five and Dime, and the company headquarters includes fifteen buildings along Walton Boulevard (US 71B) in the western part of the city. 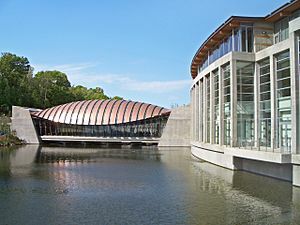 Just north of downtown Bentonville is the Crystal Bridges Museum of American Art. Founded by Alice Walton in 2011, this museum contains many masterpieces from all eras of American art, including many works from Walton's private collection. Across the square from the Walmart Visitor Center is the Benton County Courthouse, the center of the county government. Bentonville High School is located just west of Interstate 49/US Route 71 in central Bentonville. The Fayetteville–Springdale–Rogers Metropolitan Area consists of three Arkansas counties: Benton, Madison, and Washington, and McDonald County, Missouri. The area had a population of 347,045 at the 2000 census which had increased to 463,204 by the 2010 Census (an increase of 33.47 per cent). The Metropolitan Statistical Area does not consist of the usual principal-city-with-suburbs morphology; instead Bentonville is bordered to the east by Rogers, the north by Bella Vista, and the west by Centerton. The Northwest Arkansas Regional Airport is located to the southwest of Bentonville and is used to connect all of the northwest Arkansas region to the rest of the nation. Over the past decade or more, Northwest Arkansas has been one of the fastest-growing regions in the south. As of the census of 2000, there were 19,730 people, 7,458 households, and 5,265 families residing in the city. The city grew substantially in the 1990s; the 1990 population was 11,257 and the city is expected to reach 50,000 people by the year 2030. 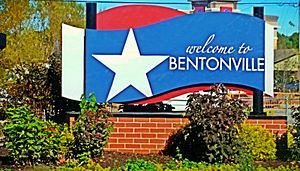 According to the US Census, Bentonville and surrounding communities in Benton County is second in growth for Arkansas and among the 100 fastest-growing counties in the United States. In the city, the population was spread out with 29.5% under the age of 18, 9.8% from 18 to 24, 34.2% from 25 to 44, 17.9% from 45 to 64, and 8.5% who were 65 years of age or older. The median age was 31 years. For every 100 females there were 93.6 males. For every 100 females age 18 and over, there were 91.3 males. Bentonville's culture is a combination of a Southern city, small town, global business hub, and the surrounding Northwest Arkansas metro. Bentonville shares many of the characteristics commonly given to Arkansas as a Southern state, yet it has also absorbed minor cultural influence from the Midwest and West. Located firmly in the Mid-South, Bentonville's culture is distinct and differs from the Delta portion of the state. Many of the city's first settlers came from Upper South states like Kentucky North Carolina and Tennessee, who found the Ozarks familiar to the Appalachian Mountains back home. The uplands of Arkansas, including Northwest Arkansas, did not participate in large-scale plantation farming with slaves like the Arkansas delta, instead electing to settle in small clusters, relying largely on subsistence agriculture and hunting rather than the settlement patters common in the Midwest and Deep South. The "hillbilly" stereotype given to the Ozarks and Appalachians is largely a derivative of the difficult topography, tendency to settle in clusters, and mostly cashless self-sustaining economy found in those regions. Bentonville's large proportion of Southern Baptist and Methodist adherents does reflect a trend often associated with the Deep South. Due to Walmart's prominence in the city, Bentonville is also an international focal point for retail suppliers and other supporting businesses. According to the Bentonville-Bella Vista Chamber of Commerce, over 1,250 suppliers have offices in Northwest Arkansas in an attempt to secure or retain Walmart's business. Symbolic of Bentonville's complex culture was a cricket game played between PepsiCo and Walmart, spectated by their respective chief executives Indra Nooyi and Doug McMillon, chronicled in a Wall Street Journal article describing the complex Bentonville culture. The game was played on a baseball field in Bentonville not well suited for typical cricket, so the players adapted new rules. The city has a league with 18 teams and a host of fans, mostly derived from the thousands of Indian natives drawn to Bentonville by Walmart software and IT jobs. Mayor Bob McCaslin says the City currently has no plans to build a public cricket pitch. From the Walmart Museum on the downtown square to the over a dozen buildings spread throughout the city, Walmart's Home Office has a presence throughout Bentonville. The Northwest Arkansas Regional Airport has direct commercial flights from many large destination cities not typical of airports its size due to the supplier community. Bentonville High School has programs to assist the sizable transient student population, including international students, for those who have recently relocated to Bentonville. Peel Mansion, built in 1875, is now furnished with period pieces and offers tours and rentals for private events, such as weddings. 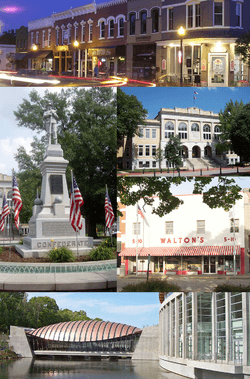 Bentonville contains over 30 listings on the National Register of Historic Places (NRHP), the official federal list of districts, sites, buildings, structures, and objects deemed worthy of preservation. The city contains two residential historic districts, the Third Street Historic District and West Central Avenue Historic District. Both districts contain historic residences notable for their architectural styles and contributions to the city's early history. Together, over 40 houses are listed as contributing properties. Preeminent individual residential listings within the historic districts include the Craig-Bryan House, Elliott House, James A. Rice House and the Rice House on "A" Street. 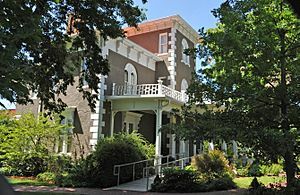 Residential listing elsewhere in the city include the Peel Mansion Museum, Stroud House and Col. Young House. 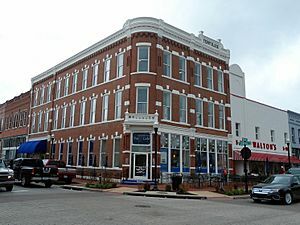 Also included in the NRHP are historic public structures, such as the Benton County Courthouse, Benton County Jail, Bentonville High School, commercial structures such as the Benton County National Bank, Massey Hotel, Roy's Office Supply Building, and the Terry Block Building, and two cemeteries. 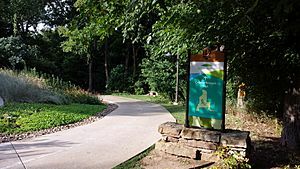 Over 300 acres (120 ha) of city parks throughout the city offer educational, recreational and outdoors opportunities to park visitors. The largest park surrounds Lake Bella Vista and includes a popular perimeter fitness trail and disc golf course. Memorial park features the Melvin Ford Aquatic Center as well as baseball, basketball, tennis, volleyball, skateboard, softball and soccer facilities. The four baseball fields at Merchants Baseball Park have hosted the Bentonville Youth Baseball League since its inception in 1954. Park Springs Park was created in the 1890s following the discovery of two springs with purported healing powers. The Burns Arboretum/Nature Trail was added in 1996 and includes a State Champion tree. 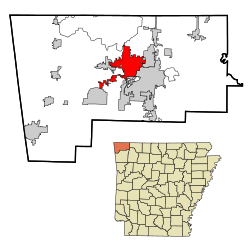 Bentonville, Arkansas Facts for Kids. Kiddle Encyclopedia.